How much does it cost to travel to Beijing? How much money will you need in Beijing? ¥383 ($57) is the average daily price for traveling in Beijing. The average price of food for one day is ¥86 ($13). The average price of a hotel for a couple is ¥410 ($61). Additional pricing is in the table below. These average travel prices have been collected from other travelers to help you plan your own travel budget. How much money do I need for Beijing? Beijing is the capital of China and, with 21.5 million people, it is the second most populated city in the world after Shanghai. It is a city that keeps pockets of its history hidden in old neighborhoods or back alleys, despite the constant change and modernization that goes on around it. As the capital city of China, there is plenty of history and culture. You can still get yourself lost in one of the last remaining hutongs, which are old neighborhoods that remain untouched by the city's modernization. The alleys that weave between the old homes are lined with drying clothes, corner markets, and people going about their daily lives the way they have for centuries. Surrounding these hutongs you'll find modern buildings and a booming economy, all threatening to destroying these last bits of Beijing's history. Beijing offers a glimpse into a microcosm that represents the entire country of China. Make sure you give yourself enough time in China to truly experience Beijing. You can pass a lot of time soaking up life in the city, which remains as diverse as the country it resides within. Beijing has no shortage of sights, the most famous of which is the Forbidden City. The Forbidden City housed the imperial family for centuries and today it is visited by thousands of tourists every year. More modern sights include the Birds Nest Stadium and Olympic Village, which remains a tribute to the 2008 Olympics hosted by Beijing. It is best to visit the Olympic Village at night when everything is impressively lit up. Other famous sites in the city include the Temple of Heaven, Lama Temple, Tiananmen Square. Popular parks in the city include Beihai Park, Chaoyang Park, and Ritan Park. It's also possible to get to various sections of the Great Wall of China quite easily from Beijing. Beijing can be divided into five districts. Dongcheng District is the urban area found on the eastern half of the city's urban core. It covers 24.7 square kilometers and includes Wangfujing, Dongdan, and the Beijing Railway Station. The Chaoyangmen area is found in the district and is where you'll find the Forbidden City, the Temple of Confucius, Imperial College, Tian'anmen Square and many other sights. 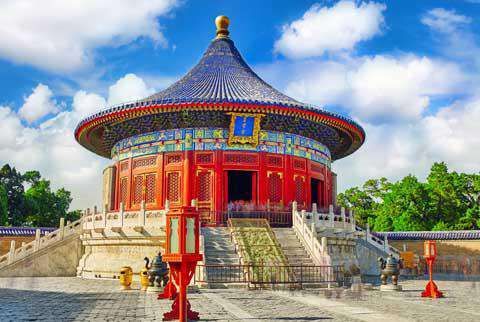 Xicheng District is 32 square kilometers and has the city's commerical district, Beihai Park, and the Beijing Zoo. Chaoyang District is where you'll find most of Beijing's foreign embassies as well as Sanlitun bar street and Olympic Park. Haidian District is a suburban area with many universities and a large foreign population. Shijingshan District is located west of the urban core and is part of the Western Hills area. Beijing is a large metropolitan city with countless activities that you can enjoy. Theater, music, and the arts are all represented throughout the city. An interesting experience in Beijing is to take in an acrobatics show, with performers and contortionists that can bend and twist in the most unexpected ways. The opera house also offers shows and performances that are well worth an evening's time. The city has many interesting festivals throughout the year as well. Some of the more popular ones include Temple Fair, the Grand View Garden Fair, Fragrant Hills Red Leaves Festival and Yanqing Ice and Snow Festival. Food in Beijing is delicious and diverse. The most notable dish is, of course, the famed Peking Duck. Dining on Peking Duck in China is an experience not to be missed. The meal is elaborate and quite filling. The duck is served in its entirety with a plum sauce and the remaining bones are made into a soup that follows the main dish. Another traditional favorite is the Chinese "Hot Pot". This soup is made at the table and includes a range of ingredients such as thin slices of meat, vegetables, and noodles all cooked in a boiling broth. The soup is served with a a tasty peanut sauce. Also enjoy a traditional breakfast of dumplings and deep fried bread. This is a cheap and delicious way to start your day. In the evening head to the night market, which has become a favorite among tourists. While it's no longer as authentic as it once was, it still holds on to some of its original charm. Getting around Beijing can be a little frustrating because of it's large size and crowded nature. Communication can also be a bit of a challenge but English signs became much more common following the 2008 Olympics. In particular, you will find a lot of English on the subway system which is surprisingly easy to navigate. It is the best way to make your way around the city, although buses are convenient as well. Subway tickets cost roughly 4 yuan. Buses travel throughout the city and lines are numbered between 1 and 999. Buses with numbers under 300 serve the city center and those over 300 travel to more suburban destinations with those over 900 going to rural districts. Taxis are also abundant, but prices should be negotiated in advance, particularly in the evening when drivers tend to charge unreasonably high markups. The neighborhood around the drum tower has lots of activities, night life, and restaurants. Wander through the hutong alleyways, stroll along the nearby lake surrounded by trees and restaurants, dine at one of the high end places or one of the cheap hole in the wall eateries. Take the subway to the Gulou station and walk south towards the towers, or just get yourself lost and enjoy the experience. If you're looking for a reliable meal in an air conditioned environment, you can head to one of the many Ajisen Restaurants around town. While it's actually a Japanese chain, they've popped around all of the major cities in China. I don't normally recommend chains on the road, but this is a reliable good one that offers food you won't typically find at home.